Aaah... it’s the brain-flash that says, “Why didn’t we think of that before?”. 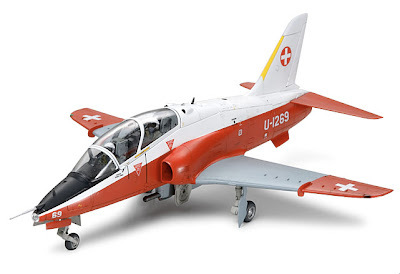 The Tamiya 1:48 BAe Hawk Mk66 comes in Swiss Air Force markings, and - ta-da! - a pair of heavyweight pilot figures, made of metal instead of plastic. The result is that they combo duties as crew and nose weights. At last, you don’t have to pack the nose with assorted bits of lead shot, so for this aircraft at least, tail-sitting is not an option. The renowned manufacturer Cartograf has produced five sets of decals for Tamiya, and in an international hookup, Italeri makes aircraft parts. In real life the Hawk and trainers like it are not large aircraft, so 1:48 scale really suits it - the finely crafted model measures 242 mm (9.5 in) long. The real Hawk (its first flight was 35 years ago) is a highly successful aircraft, with 900-plus made so far; they are flown by air forces all around the world. The Swiss Air Force flew Hawks for about 15 years, until they were sold to Finland in 2007. The Finnish Air Force currently has 18 Mk66 and 47 Mk51 Hawks in service. The Tamiya Hawk with its paunchy pilots should be available in stores and online retailers shortly.